This week we’ve had 2! 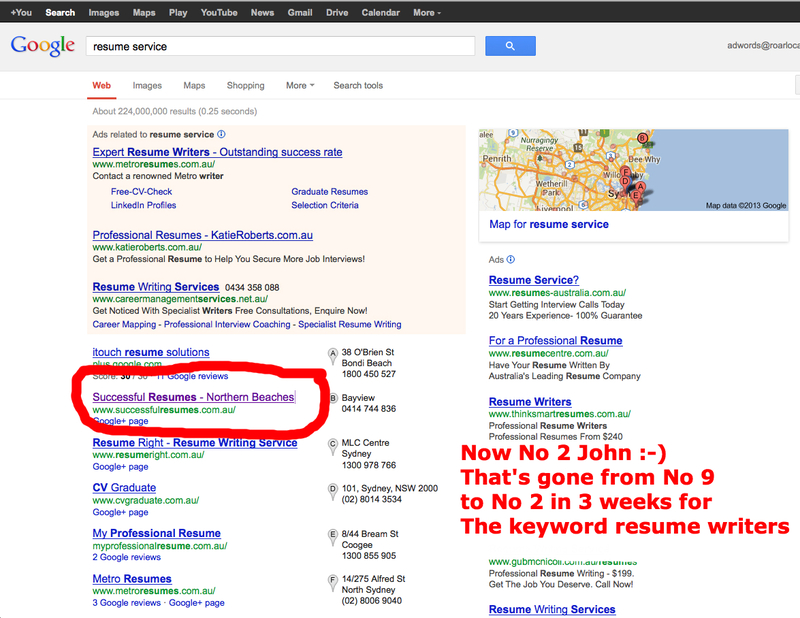 We ranked one of our clients for a VERY competitive keyword in 3 weeks and we’re now Google partners! First up we’re now ROARlocal Google partners! We’ve had to work bloody hard to get our partner status, and thanks to the hard work of Libby and Inga this week this came through. We’re chuffed to bits, as this means we can help our clients at a far higher level and give our clients access to some very slick tools that will make them even more money than we’re already helping them make. As you can see, this is for one of our clients in Australia, they’re resume writing professionals with offices right across Australia. Using our proprietary SEO process we’ve taken them from the bottom of page 1 to the top in just 3 weeks. I have no doubt we’ll get them to position 1. This does take some investment, depending on the network. If you’re just starting, getting a few PR 2-3 sites will cost you about $200, and get you GREAT results as long as you do good keyword research. If you’re a vet or have a big client budget, you can pick up solid PR 5’s for about $150 to $200 a pop. Then it is just how powerful you want your network to be. If you’re doing good research, $2k worth of sites will rank you for about whatever you want. Now if you want to get REALLY competitive, aka your client is paying you 10k+ a month to rank for some serious keywords, then spending 5-10k on a network is a way to ensure they will always have results. Our rule of thumb is that we spend 100% of the clients first month’s fees buying and building a powerful blog network for them. This means we work for free for the first month, but we rank fast and get great results, which of course leads to more business. If you want to save some money and just want some basic PR 2’s to 3’s, then this is the way to go. PR Powershot basically goes out and finds expiring high PR domains on Godaddy. It then allows you to jump in and buy them at the last second. This takes some time and you’re going to have to dig to find some winners. However, I have found and built many small reliable networks using this. The great thing is you can get most PR2 to PR3 sites for about $20 bucks. This lets you get started fairly cheaply. A lot of people will go out there and bid on high PR domains. They will then sell them for profit. These are called domain brokers. Now there are a few ways to find them… Also when you’re making mass PR networks having your own private list of domain brokers is very important. Its like having the “hook up”. Google : Do a bunch of related Google searches. You will have to dig, but vendors will show up. The digital point buy/sell forum : This is where you will find a lot more underground vendors. Other than that you might have to stick to using some tools to find the really high PR domains. This is done by throwing the site into majestic SEO. What we want to see is a large amount of links coming from good sources. This is because when a domain expires, if it does not have a healthy link profile, it loses PR fast when the content changes. We will be changing the content, so it is super important that the site has good links. On top of this, the links ALSO effect the amount of link juice the site will give. A PR 5 with 100k links will give more juice than a PR 5 with 40 links. This also depends on where the links are coming from, and the PR of the links, this can be a pain to find out though. In short, a good amount of links with a good trust and citation flow (10+) is a good sign. The next thing we need to do is make sure this is not a fake PR domain. Fake PR domain: When you 301 redirect a high PR domain to another site, the site gains the PR of the redirected site. A lot of people will do this, then sell the site that gains the “fake PR”. Then as soon as it is sold they will remove the redirect, thus wiping out the sold sites PR. This is very easy to check for. Simply go to this fake PR checker. Throw the domain in and look at the results. A lot of people will go to Google and enter “site” (the url). If the site is indexed it will show up. I go one step further though. I simply to put in the domain name (roarlocal.com.au). If the site is healthy and has PR it will show up due to its exact match-ness. If it is not showing up this is usually a sign the site stinks. It might be indexed, but that does not mean its not penalised. If you do not know, Google does not like blog networks. This is because they work REALLY well and are very hard to find without a manual review… IF they are done right. Now if Google finds your network, your PR sites will get de-indexed and your money sites will get a penalty. We want to avoid this. The good news is that if you follow a few simple steps it is highly unlikely that your PR sites will ever be found. While I personally believe this is a tad overkill, it is basic practice to put your sites on what is called “different class C IP hosting”. We do this so that Google cannot simply check a single IP and find all of your PR sites. Though keep in mind, if someone is manually checking your IPs you’re probably screwed anyway, unless you have a very natural looking network. If you are not very technical, don’t worry. Simply sign up for SEO hosting. It is a fairly inexpensive way to have all your sites on different IP addresses. Then simply install WordPress and hosting as usual… If you do not know how to do that, then Google it. This will give you very basic IP protection. I would not dive any deeper than this though. Your IP addresses won’t usually get looked at until you’ve made some other mistakes. This means if you have two PR sites linking to your money site, do not link them together. This leaves a huge footprint and sets off a ton of red flags. First off (and I don’t care what any sales letter tells you), there is no such thing as a safe advertised network, and there never will be ever again. What drives me nuts is that people think Google is clever enough to track their analytics, hosting, etc., but is too stupid to read the huge SEO forums online when it comes to combating spam. If you advertise selling your networks links on forums or BIG public places, you’re gonna catch a spanking. This also puts your network at a huge risk. Do not do this OR if you want to, do it privately. By this I mean different WordPress themes, unique content and different layouts. Now take this a far as you want. This actually does not make your network any less trackable from a “technical” side. It also does not effect how powerful the links are. The reason we do this is to make our sites not so obvious at first glance. If all your sites are just on a blank WordPress theme with the same content, its very easy to spot it as a blog network. Now if you want your network to even be able to pass a manual review, go all out with this. Make your sites look legit; put decent content to them and format them differently. I am somewhat in the middle with this. I make most of my network sites “video style” sites, or add a few 150 word articles. I also try to make the sites seems like real sites. REMEMBER: The chance of your network getting a manual review are slim to none. If you’re brand new to this, it is more important to take action and just get the network up. Do not spend all night trying to make your network “pretty”. It truly does not matter when your network is in its “baby” stage. If you go on any forum, you’re going to see people endlessly debating about the stuff above. Just remember these people are stupid… Like really stupid. As long as you don’t do anything blatantly stupid, your chances of getting busted are pretty unlikely if you have a small personal network. So this is where we make our network 3x more effective. This is because we are going to turn our sites into “perfect link farms”. We are going to do this by making the sites relevant to your niche. So What Does It Mean To Be Relevant? Being “relevant” is actually pretty simple. Google looks at some very basic things when determining what a site is “relevant” to. Whatever you fill the above areas with will determine what your site is “relevant” to. So, ideally, if we are trying to rank a site for a keyword like “spider catcher for sale”, we want to make our PR network links relevant to “spider catcher”. So we could go out and buy five PR5 sites. 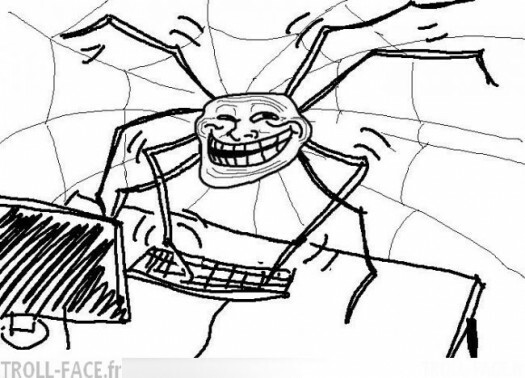 We would then fill these sites with spider catcher related info. Ideally, we would want a site with a relevant URL. This is VERY hard to do though, and is not that important. So in short, do not let a PR site’s URL be a factor. Now this is the bare minimum you have to do to get maximum results. If you want to make your PR sites seem more legitimate, go crazy. Overall though, this will make your sites the perfect place to get links from. Look… It would be a HUGE waste of money if you could only use one PR site for one money site/site your trying to rank. For example, you might have other sites you want to rank in Google but your “spider catcher” site is not relevant. Remember what I said in the beginning though… PR links are still very powerful even if they are not relevant. So, what I do is build a PR network around the most competitive niches I am targeting. This way the links give me a lot of ground in the TOUGH niches. Then I will add a few other links on the PR site to my easier niches. This way my tough niche sites still rank and my lower competitive niche sites also rank, even though they do not have the most “relevant” links. Okay, now that we have our sites set up, time to just slap links all over them… NO! If you have spent any time here you already know there are a ton of factors that effect how much juice a link passes on. You also know that Google has some pretty sharp over-optimisation rules. One thing you’ve got to keep in mind is that you do not just have to place one link per money site on your PR sites. Each link will send more juice to your site, with diminishing returns. This basically means each links is less powerful, but is still powerful, since it is coming from a high PR relevant site. Having too many links on your PR site will not totally ruin the power of your links, however for optimal results try to keep your outbound links under 10. You must, must, must get your links on the page with the PR. This will always be the home page. There are a few ways to do this. The best place to place the link is at the start of the content. A cool thing about sidebar links, though, is that you will get multiple (site wide) links from it. This gets you a solid amount of link juice. As long as you follow the simple guidelines above you’re gonna have a hard time messing up. Want us to look after your SEO?